I don’t know about you, but the warm, bright spring weather always has me craving lighter fare. While pasta is in heavy rotation during the winter months, I’m just not feeling it as much in the spring. That’s where this spring veggie quinoa comes in. 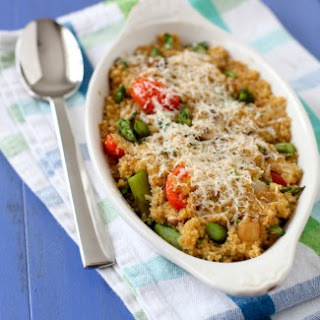 It is very similar to a baked pasta dish with veggies and cheese mixed in, but it is lighter, healthier, and seems much more fitting for the season at hand. I threw this meal together on a gorgeous sunny day when some family and friends were visiting. For many, it was their first time trying quinoa and it received rave reviews across the board. 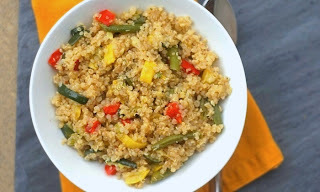 Quinoa is a protein-packed whole grain (technically a seed) that is similar to pasta but with a slightly nutty flavor. 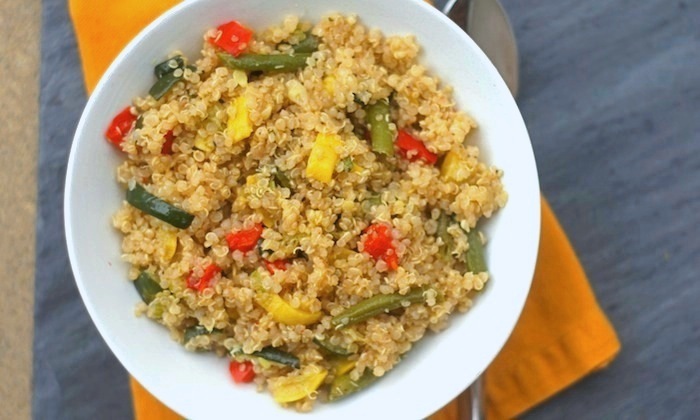 If you are new to quinoa, this dish is a great way to experience it. Enjoy! Preheat the oven to 400˚F. Cook the quinoa according to the package directions, replacing the water with vegetable broth for cooking. Once cooked, set aside. Add the asparagus to a small saucepan and cover with water. Bring to a boil and cook just until crisp-tender, 2-3 minutes. Drain well and set aside. Meanwhile, in a large skillet or sauté pan, melt the butter over medium-high heat. Add the onion to the pan and cook for about 2 minutes. Mix in the mushrooms and cook until most of the liquid has evaporated, about 5 minutes. Stir in the garlic, salt, and red pepper flakes and sauté just until fragrant, about 30 seconds. In a large bowl, combine the cooked quinoa, blanched asparagus, sautéed veggies, tomatoes and spinach with the shredded Gouda and half of the Parmesan. Season with additional salt and pepper to taste. Transfer the mixture to a lightly buttered 9 x 13-inch baking dish and spread in an even layer. Sprinkle with the remaining Parmesan. Bake for 15-20 minutes or until lightly browned on top. Serve warm.